This bonsai by Liew started as a cutting from a Fu-Kian tea tree in Taiwan. It's considered very unusual because of its structure, called the "Above Root Literati Style." This plant is 25 years old. OUR WORLD increasingly demands more of us -- more production, more efficiency, more endurance -- and yet it expects more than ever for us to appear less worse for the wear. Our faces are Botoxed, our tummies tucked, our homes feng shui'd and our lawns manicured. For us to be considered true successes, we need to make it all look easy. Enter Walter Liew, a 50-year practitioner and master of bonsai, in which trees are grown, trained and shaped to create the illusion of age and hardship. Liew owns and operates Dragon Garden, a 20-acre oriental garden in Waimanalo that houses the Hawaii Bonsai Culture Center, which displays more than 200 bonsai. Some of Liew's finest bonsai are also on display at the ARTS at Marks Garage through July 27 and in a permanent exhibit at the Honolulu Academy of Arts. Liew said his art form illustrates the character and elegance that age and hardship cultivate. "That's where the beauty comes from," he said. And working on this art form changes people for the better. "Suddenly, the world is enlightened," he said. "Bonsai brings people peace and harmony." According to Liew, when all our basic needs are met, our attention automatically turns to our "seki," the part of us that seeks beauty, purity and peace. Seki is a mental and spiritual condition, reflecting an innate desire to be happy. It is the seat of our aesthetic desire, that inborn ability to appreciate things artistic and beautiful. It is the place in ourselves that yearns for refinement, the place that motivates us to cultivate our highest mental, spiritual and moral sensibilities. It is the place from which art, poetry, religion and the healing arts spring. 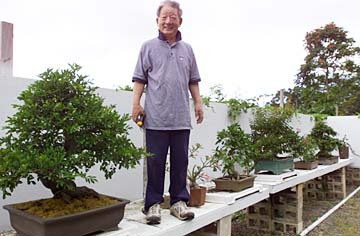 Walter Liew finds himself atop his own bonsai tables in Waimanalo to do a bit of pruning. "Paintings show beauty through line and color. A sculptor creates three-dimensional beauty. Poetry defines the relationship between reality and human beings. Music expresses emotion through various combinations of sound," Liew said. "Bonsai gives you all of that, plus it's a living art. And it's also an unfinished art. No matter how old a tree is, it can always be improved," he said. "With other forms of art, there's a point when they cannot be retouched. After a piece of music is done, it can't be improved on. If you change a note, it will spoil it. Can you see improving the Mona Lisa? Bonsai is very refined. It can go on forever. "It is the art above all arts." FOR THE PAST 30 YEARS, Liew, trained by bonsai masters in China and Japan, has traveled throughout the United States and Asia to seek out bonsai hobbyists. He found that "very few people outside Asia really understand what bonsai is." Liew looks to history to explain this. Bonsai practitioners in Japan have historically belonged to the Zen class, a high class in Japan's caste system, and therefore, an educated class. "They practiced Zen using the hobby of bonsai," Liew said. But the Japanese and Okinawans who immigrated to Hawaii in the 1800s were mostly uneducated and thus knew little about the culture and history of China and Japan, which is integral to understanding the art. Many techniques employed by bonsai hobbyists today sprang from the immigrants' attempts to mimic bonsai masters. Walter Liew tends to his many bonsai at the Hawaii Bonsai Cultural Center. At left is a bonsai by Liew that began as a ficus cutting about 35 years ago. It was trained to the rock base only 10 years ago. "Many people think bonsai is a piece of tree, or an old tree, in a pot. You give it lots of fertilizer and keep it healthy. That is NOT bonsai," he emphasized. "Bonsai is a very artistic tree in a very carefully selected pot. If a tree is put in a pot but it's not trained, it is not bonsai. Bonsai are well trained. They are artistically wired into a specific style and they become old or have the illusion of an old tree in the wild. THAT is bonsai." When Liew teaches bonsai, he gives his students a crash course in Asian art. Situated in his enormous workroom/classroom is Liew's personal Japanese and Chinese art collection, comprising scrolls, pottery, paintings and furniture, for his students to view. "Bonsai is Asian art, but my students must know other art as well," he said. "For example, when a bonsai is completed, it is the shape of a triangle. Formations of triangles are also evident in Chinese and Japanese paintings." "My job is to teach people right thinking." THE OTHER, more practical side to bonsai is horticulture. Liew said it takes about five years to create a presentable bonsai, and there is a chronology to developing each part of a tree. 1. The root system must be developed first, Liew said. A good bonsai requires a solid foundation. "Many people forget one thing -- they must have a solid root system. And for it to be good bonsai, there must be four or five roots showing above the soil, and they must radiate in different directions. That gives the quality of old age and stability." 2. Next, the trunk is developed. All the branches are cut off so that "all the energy can go to the trunk." The trunk is the most important element of a bonsai, Liew said. It must display character. "Without trunk character, you don't want the branches to occupy your time. You must train the trunk first," he said. "A good trunk must definitely have knots and bumps. That's what my old man's face looks like." 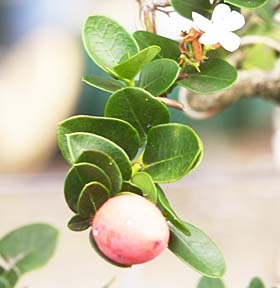 This is the fruit and blossom of a Karrisa Mountain Apple bonsai that is 10 years old. According to different bonsai styles (see accompanying box), trunks are often tapered, curved and even carved. Liew carved the trunk of one bonsai to create the illusion of hardship, as if the tree were hit by lightning. 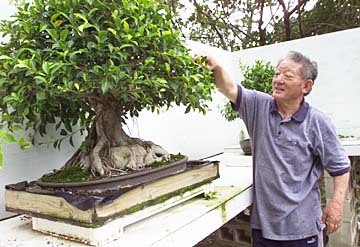 Bonsai are stylized to display 30 percent of the trunk, Liew said. This is fundamental to being able to call a tree "bonsai." Yet many so-called bonsai are laden with pretty branches that hide the trunk. Liew calls this transgression "the muumuu." 3. When trunk character is achieved, the tree's branches are wired into aesthetically pleasing styles of curves and angles. A 20-year-old tree can be rewired 10 to 15 times. "To improve is to rewire," he said. 4. The final step in stylizing a bonsai is shaping the foliage into an asymmetrical triangle, which many Asian philosophies equate to Heaven, Man and Earth. To achieve this shape, "the first branch is the main branch. It is smaller than the trunk. The second branch is smaller than the first, the third is smaller than the second," Liew said. "The branches get smaller as they get closer to the apex." Most good bonsai also reflect the "Rule of Thirds." This means the bottom third of the tree should be roots and open trunk without branches. The middle third bears some branch structure and also open space to show the trunk. The top third comprises smaller branches and the apex of the tree. And when all that work is done? "Looking at a beautiful tree is like looking at your beautiful child," he said. "You'd give up self for it." LIEW, 68, was a college lecturer who taught Oriental arts and Chinese literature at institutions such as Rice University, Taiwan University and the University of Hawaii, until he decided to devote all his energy to bonsai 10 years ago. His passion and affinity for the art can perhaps be attributed to his roots. He was born in Shangdong Province in Northern China, the birthplace of philosophers Confucius and Lao Tzu. Bonsai is a meditation," he philosophized. "If you're stressed and you work on a tree to make it look 100 years old, you imagine it in the forest. And your psyche is all over the world. That's therapeutic. That's healing. It makes you a better person, so you're a better family member, a better worker, a better citizen." Today, he loves his retirement life, finding peace in his expansive Dragon Garden, where he cares for his trees 15 hours a day. "When I work on a tree, I am talking to nature," he said. "Just like a painter concentrates on his brush to make something beautiful, my way is talking to my tree." Also: Bonsai lecture and demonstration by Walter Liew noon to 1 p.m. tomorrow at Marks Garage; free. When: 3 to 5 p.m. Oct. 6, continues for 9 Sundays. Dates for 2003 classes also available. There are four elements that contribute to bonsai presentation: a plant that is artistically trained; the media, or soil mixture, in which the tree is planted; a pot that is selected according to tree species, height, style and thickness of trunk; and a dai, or display table. There are proportional guidelines to selecting the right size pot for a tree. In general, the depth of the pot should be equal to the diameter of the trunk, while its width should be roughly half of the widest part of the tree. The species of the tree decides the color and shape of the pot. No one knows when bonsai really began. Plants cultivated in pots were depicted in Egyptian art 4,000 years ago. In China, where it is likely bonsai originated, plants were used in ceremonies. This led to putting plants in pots to make it easier to transport them and to better control the appearance of flowers and fruits to coincide with ritual observances. 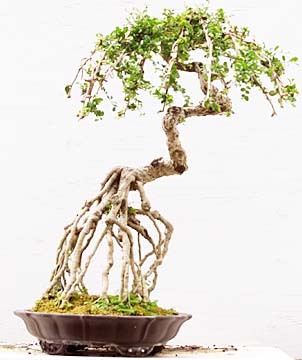 China probably introduced bonsai to Japan in the 8th century, along with Buddhism. It was through Japan that the Western world was introduced to bonsai, which is why many people still believe that bonsai is an ancient Japanese art form. "Today, it's impossible to find a city on earth that does not have bonsai hobbyists or a bonsai club," said Walter Liew, a bonsai master who owns the Hawaii Bonsai Culture Center in Waimanalo. "Bonsai is so popular worldwide because it shows the beauty of nature." Liew belongs to the Bonsai Club International, which boasts membership in the thousands. In 2000, Hawaii hosted the club's convention, and 800 hobbyists from 49 nations gathered here. Members brought to life the club's motto, "World peace through bonsai." "We made global friendships," he said. "Now, every time a hobbyist comes to Hawaii, they look for me. If I go to Brazil or Puerto Rico, I have many bonsai friends. And these are friendships that will last forever because we share the same philosophy." 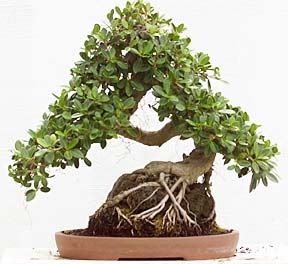 There are five famous styles of bonsai tree forms. Each style represents a tree that has encountered various elements of nature or has been grown under specific conditions. Countless other forms are variations of these five classic styles. >> Formal Upright Style -- The tree trunk of this form is straight and tapers toward the apex. Branches alternate from side to side. This style occurs in nature when a tree is grown in an ideal situation, with no shortage of nourishment or exposure to adverse weather. It represents stability, tranquility, strength and dignity. >> Informal Upright Style -- This style is considered the most beautiful and is a "model" style in Japan and China. This kind of tree has a trunk that is pleasingly curved from side to side, and its apex is off-center and bows toward the viewer. Its branches radiate only from the outside curvature of the trunk. An informal upright represents stability and tranquility. >> Slanted Style -- This form represents instability, uneasiness or motion and depicts a tree exposed to strong winds or one reaching for sunshine out of the shadow of a rock, tree or building. The trunk of a slanted bonsai can be either slightly or dramatically slanted, and its roots serve as an anchor. >> Half Cascade Style -- Branches in this form are level with the bottom of the tree's pot, so its trunk grows at first upward, then turns downward. Semi-Cascades depict a tree that grows on or near vertical rock faces or by the side of water, where light reflects on the water to the branches. This style also symbolizes a beautiful, feminine girl who has long hair. It represents peacefulness. >> Full Cascade Style -- This form depicts a tree clinging to a cliff face, where it is shaped by snow and wind. The branches dip below the bottom of the tree pot. This style of bonsai signifies humility.